Insulin administration has traditionally been one of the last steps in the treatment of type 2 diabetes mellitus (T2DM), but that’s changing. March 29, 2012 (New Orleans, Louisiana) — Insulin administration has traditionally been one of the last steps in the treatment of type 2 diabetes mellitus (T2DM), but that’s changing, says Jonathan Marquess, PharmD, from the Institute for Wellness and Education Inc in Atlanta, Georgia. 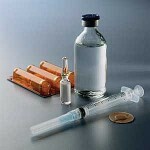 He discussed the benefits of early initiation and intensification of insulin therapy in patients with T2DM at APhA 2012: American Pharmacists Association Annual Meeting and Exposition here. Dr. Marquess spoke with Medscape Medical News about the benefits of early insulin initiation and about strategies for working with patients with T2DM. Medscape: Would you describe early initiation and intensification of insulin therapy in patients with type 2 diabetes mellitus? Dr. Marquess: It means utilizing the guidelines from the American Diabetes Association (ADA) and utilizing insulin sooner rather than later. All too often, physicians, nurses, and pharmacists, will advise patients to take oral agent #1, then oral agent #2, then oral agent #3, and then say, “Wow, I guess it’s time to start insulin.” Whereas, the data would show us that we ought to be starting insulin a little bit sooner, rather than utilizing all these oral agents. Medscape: Why is this topic important? Dr. Marquess: It gets back to the control. We have got a failing grade on the number of patients that have their diabetes in control. It is getting better, and I personally feel one of many reasons for this is that pharmacists are getting involved in diabetes management and medication therapy management. There’s also an economic issue involved. In a lot of patients, the hemoglobin A1c is above 7%. The A1c should be 7%, according to the ADA. We know that diabetic complications happen at a more prevalent rate when the A1c is above 7. Those diabetic complications are where we’re really spending big, big money in this disease state. Medscape: What have researchers learned most recently about the benefits of early initiation and intensification of insulin therapy in these patients? Dr. Marquess: The proportion of patients with diabetes achieving [A1c levels] less than 7% is around 56% or 57%. The lower the A1c, the more important postprandial glucose levels are, so that’s why you also need to be checking their glucose. You need to be looking at their numbers. Not only if the glucose level is right in the morning, but also 2 hours after a meal, and that’s when you have to also start thinking about using mealtime insulin. Also, this is not data that’s just been published, but it’s very important data, in my opinion. It’s from the United Kingdom Prospective Diabetes Study, that says a 1% A1c decrease really reduces the risk of complications. Medscape: How is insulin currently being used in patients with type 2 diabetes? Dr. Marquess: We have great medications, excellent medications, and we have some fantastic insulins now that we didn’t have available just a few years ago. We can now match patients’ physiologic problems with the insulins. If they need a long-acting basal because their fasting plasma glucose levels are out of control, we’ve got some great basal insulins. If they need a very rapid-acting mealtime insulin, we’ve got 3 of those available now that are very, very good. Medscape: What are some common misperceptions about the use of insulin in patients with type 2 diabetes? Dr. Marquess: A big misperception is patients think the needle is really, really long. Some patients are scared of needles. Patients think they will be perceived as having bad control of their diabetes, or that they’ve done something wrong as a patient, but that’s not true at all. That’s a common perceived barrier. Some people say insulin is inconvenient to use. I think sometimes there is a fear of hypoglycemia, too. Medscape: How do you deal with patients who are afraid of needles? Dr. Marquess: I always say, “Let’s talk about insulin pens.” Make sure the patient is using insulin pens whenever possible, because they’re easy to learn, they’re easy to teach, there are fewer medication and dosing errors, and in my opinion, there’s better accuracy. Insulin pens can also usually overcome issues patients may have with dexterity. Medscape: What are some of the challenges associated with educating patients with type 2 diabetes and ways of handling those challenges? Dr. Marquess: One of the big challenges is that this is not a 10 second, “how to use your inhaler” talk. This disease is very complex, so it takes a little while, because you have to talk to them about things like watching what they’re eating. You have to talk to them about blood glucose monitoring, perhaps how to use a new glucose meter and what those numbers actually mean. You have to talk to them about physical activity and how important that is, and how if they do get some physical activity, how their blood glucose might drop, and how to treat hypoglycemia with 15 grams of carbohydrate. It’s a multifaceted disease. It’s also a progressive disease. It’s not like you can educate patients for 5 or 10 minutes, and not ever have to go back and talk to them about their disease again. It’s something you have to continually talk about, and you have to continually ask the patient how they’re doing. Medscape: Is there anything else you’d like pharmacists to know about this topic? Dr. Marquess: There’s no doubt that there’s an epidemic of diabetes. We have some 26 million people with diabetes, and the numbers keep going up. Complications are happening at a rapid rate. The positive thing is that it’s a disease that can be managed, if patients can get to know their pharmacist, and if pharmacists will utilize their great skills.